I originally began writing this piece for publication by MTBProject.com during their March, 2017 coverage of women in the bike world as part of International Women's Day and their accompanying articles. Due to personal issues and issues with reaching different sources for expert opinions, I blew through my deadline and it was never published upon completion. I do, however, feel that this adds important points and data to the current bike industry narratives around the value of an emerging female market, and am publishing it here for free for the open use of the bike industry at large. If you'd like to use excerpts of this article or would like more documentation on sourcing, please cite proper ownership of this work or contact me for more information. When we look at the biggest threats to mountain biking and cycling as a whole, some of the biggest challenges that immediately stand out tend to be growth, sustainable economics, investment potential and retention rate. There are panels, round tables, lectures and even entire weekend conferences structured around addressing these challenges inside of the bike industry; with the source of these issue constantly being debated, much of the industry focus often deals with putting out the fires that spring up. From retailers to bike parks and manufacturers to media, these problems are pervasive and demand immediate attention to stem the bleeding. The bike industry has seen waves of growth and recess but our roughly $6B annual valuation has varied little over the last two decades. In twenty years, despite the progressions in technology and accessibility, our industry growth has stagnated. 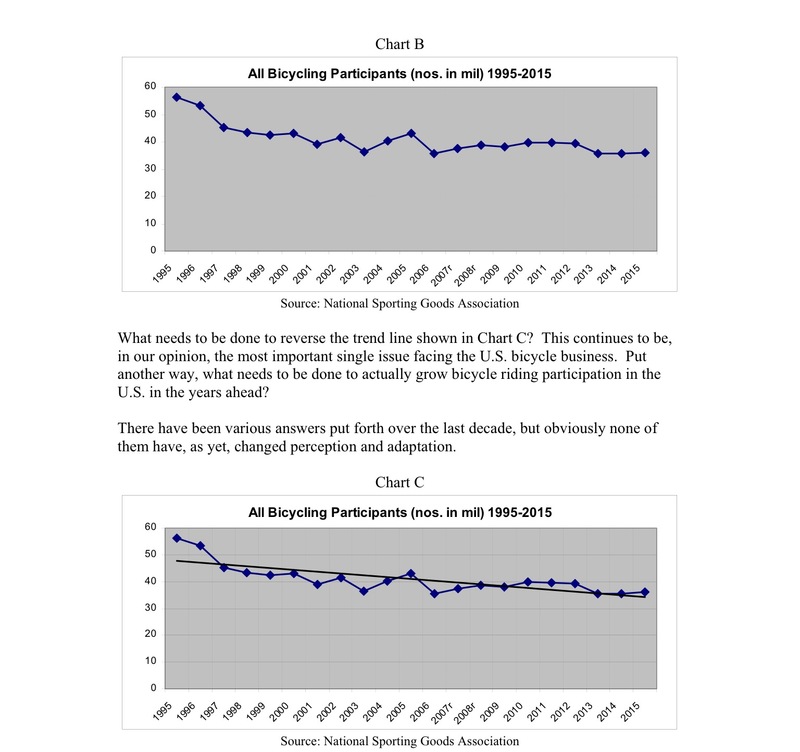 According to the National Bike Dealer's Association 2015 Industry Report (and the NSGA - National Sporting Goods Association), more Americans rode bikes in 1995 than they do now and that number has almost halved in the last two decades. From nearly 60 million riders in 1995 to 36 million in 2015, the data is a stark picture: the bike industry is splitting a smaller pie into more pieces than it can support. Growth patterns show decreased use and annual rider numbers since 1995. Between online bike dealers, Independent bike retailers and direct-to-consumer sales, increased players in the retail game has led to more availability of bikes as well as a wider selection to choose from, and all of that completely ignores the value of the used-bike sales market. With so much convenience and supply, why has the demand decreased? In a world where action-sports is a multi-billion dollar annual industry, why are bicycles falling so short? In fact, why does the bike industry continue to hover around the 1973 high-mark annual unit sales number of 15.2 million? In 2015, we were slightly above the forty-year-old measurement at 17.4 million bikes sold in the US, but over the course of forty years, that doesn't seem like a commensurate amount of growth. Comparatively, the US population has skyrocketed from 211.91 million in 1973 (the same year as our 15.2M record) to 323.58 million in 2017. That doesn't bode well. But it's easy to get lost in sales numbers. We see huge changes in population growth, in sports spending growth, in the value of mainstream presence and the appearance of bicycles in media, but we're not seeing significant growth inside of cycling on many levels. There are many avenues we could walk down trying to find the one cause of stagnancy in cycling, but seeing the lack of growth as a symptom of a larger and entirely different issue might be more effective. Outside of the burdens of the US national cultural change and the advent of electronic entertainment, the bike industry has largely failed to capitalize on demographic engagement outside of the middle-aged white male rider. Until as recently as 2014 when 'women's specific' became the norm for manufacturers desperate to see any growth, the average viewer would have been hard pressed to find a female presence in cycling let alone racial representation. From visibility in pro races to equal representation in boardrooms, the lack of diversity inside of the bike industry is stunning. One could argue that it's even whiter, more affluent and more male than even golf when we look at the participation rates. According to The League Of American Bicyclists' 2013 "The New Majority: Pedaling Towards Equity" report, white people made 53% of all commuter trips in the US in 2010. Even worse than that are USA Cycling's participation numbers: only 16% of USAC license holders are female. 83% of the user base is male. The problem with that? It's not representative of the actual presence of women in cycling, nor does it address the racial disparity. According to a People For Bikes 2015 study, the gap isn't that big: "We found that 104 million people—a third of the population—rode a bicycle last year and of those, 45 million (43%) were women compared to 59 million men (57%). Our findings revealed less of a gender gap than the 2009 National Household Travel Survey which (using a different methodology) found that just 24% of bicycle trips were made by women." The People For Bikes study goes on to say that 95% of women ride for recreation. 95% of women ride for recreation. Even wilder than that number is the fact that women make up 60% of bicycle owners between the ages of 18-27. SIXTY PERCENT. Women are vastly underrepresented in racing and media coverage but they're still present in cycling despite the lack of advertising and outreach prior to the womens-specific hardgoods push. The People For Bikes study has important value concerning the lack of bike industry knowledge about women on bikes, participation and buying habits, but marketing to women and minorities is one small piece of the growth pie: how much of this research will actually affect a change in leadership structure and inclusion? Not only are women present in cycling, but they're leading the way. From female coaching programs and race teams such as SweetLines and Velocio-SRAM to charities like the World Bicycle Relief Fund and the Afghan Cycles documentary, many of the movements inside of cycling have women at the helm. The list of lady-led efforts to improve cycling as a sport is endless: media outlets like Total Women's Cycling, Ella Cycling Tips and Pretty Damned Fast continuously highlight the side of the bike industry that hasn't historically gotten as much coverage and the sheer number of female-led camps, clinics, forums, groups, races and brands should be recognized as legitimate entities inside of a growing sport that represent a valuable and vastly underserved audience. The volume and voice of these women and girls aren't just serious about riding bikes -- they're an economic force to be reckoned with. As such an integral part of both the bike industry and society at large, they deserve industry and company-wide equal representation. But that's where the problem sits: representation. Harvard Business Review identified six basic female consumer segments but found, at large, that "Although women control spending in most categories of consumer goods, too many businesses behave as if they had no say over purchasing decisions. Companies continue to offer them poorly conceived products and services and outdated marketing narratives that promote female stereotypes." Sound familiar? It should. Women and minorities are often under-served due to lack of representation at multiple levels in the design and production process of nearly every product in the world, which leads to lackluster purchasing by women or minorities and thus often confirming existing purchasing biases. When a product is solely made by men, it's often made for men. Humans build and create around what we know, which is most often ourselves and the things familiar to us. Unfortunately, this is where implicit bias comes into play and not only inhibits the creative process, but infringes on the quality, profitability and even the safety of a product . However, when products are conceptualized, modeled, designed, studied, built and produced by a diverse range of people who reflect global population representation and wider individual needs, those products are simply more successful. Diversity doesn't just build great products, either. It makes for better companies. In February 2016, the Peterson Institute for International Economics cited "McKinsey Global Institute (2015) estimates that a scenario in which women achieved complete gender parity with men could increase global output by more than one-quarter relative to a business-as-usual scenario" in a peer-reviewed working paper entitled "Is Gender Diversity Profitable? Evidence from a Global Survey". PIIE also notes that the study "...results suggest that the presence of women in corporate leadership positions may improve firm performance and that the magnitudes of the correlations are not small. The largest gains are for the proportion of female executives, followed by the proportion of female board members; the presence of female CEOs has no noticeable effect on firm performance. This pattern underscores the importance of creating a pipeline of female managers and not simply getting lone women to the top." In layman's terms, this supports evidence that companies make better products, have more inclusive marketing and that brands are simply more profitable when women and people of color are involved at every level. On the other side of the issue, while many studies across the spectrum exist that show the positive effects of diversity within leadership, it's not always that simple: bad diversity policies can harm companies and create or worsen cultural barriers within an ecosystem. But bad diversity policies often come from boards and diversity panels that are misrepresentative of an entire organization which creates a cycle of fallout that is often contained only by curbing diversity efforts entirely rather than restructuring them. Tokenism cannot be the answer to an under-served market that's demanding equality and parity; the integration of inclusive and effective policies must be a series of steps taken willingly by organizations that are truly committed to creating growth. When the bike industry starts to hire and listen to more women and people of color, companies will begin to avidly support female and minority athletes as equally as they support white, male athletes and when that support arrives, bike media will be forced to give an expanding and diverse audience appropriate images that represent a changing industry. Consumers buy into the things they see themselves doing: until we create an industry that welcomes and represents all riders, sustainable economic growth will elude cycling.